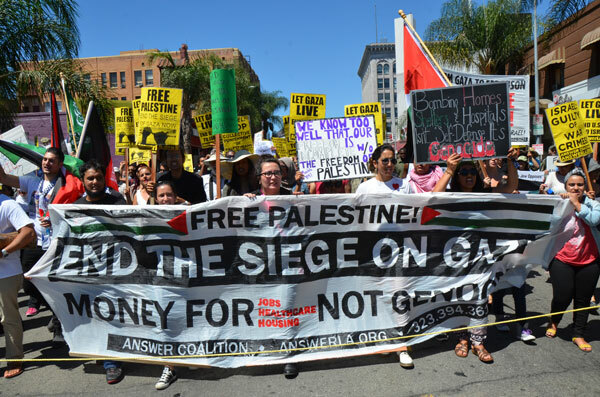 On Saturday August 16, hundreds of protesters shut down the main intersection in Hollywood and marched on CNN to condemn the corporate media’s lies and bias in reporting on the Israeli massacres in Gaza. 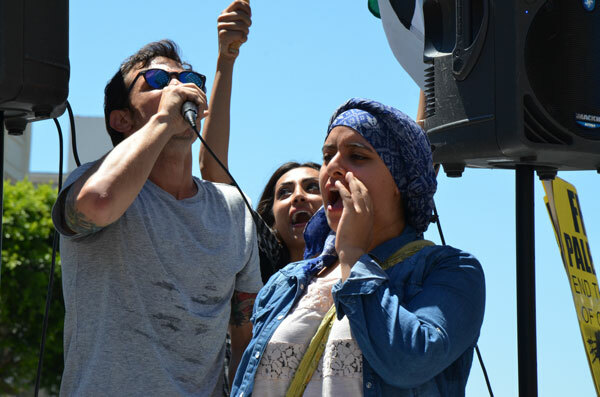 Chants highlighted the U.S. government role in the massacre by way of massive financial and military aid as well as political support and direction. Other chants focused on the media like and NBC whose corporate owner GE is profiting off of the genocide. U.S. corporations like GE, General Dynamics and Boeing are getting rich from this slaughter as Palestinians die. 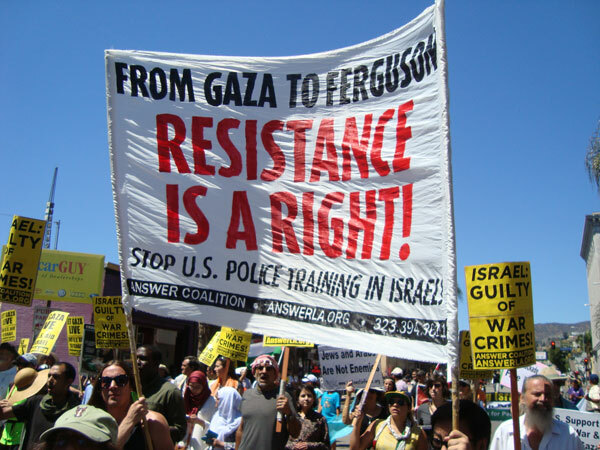 Most U.S. aid to Israel is spent by buying military aircraft, armored vehicles, ammunition etc made by US corporations and then used to kill the people of Gaza. Banners and chants called for the U.S. to spend money for education, health care, housing and jobs here at home not occupation and genocide in Palestine. Palestinian speakers gave moving talks creating vivid images of the reality that the people in Gaza face today with no water, no electricity, no safe haven and no way out while bombs ripped apart children and loved ones. Hundreds of thousands – about a quarter of the population – have been displaced as their homes have been turned into rubble. And yet they also showed the determination of the Palestinian people, the unbreakable resolve to keep the resistance alive. Andrew Nance and Genevieve Huizar spoke about racism against Arab and especially Palestinian people as a part of the occupation and massacre. They connected it to the racist police brutality that is behind the killing of Michael Brown in Ferguson Missouri, the killing of Ezell Ford in Los Angeles on August 11 and the many African American and Latino youth killed in the LA area by police. Genevieve Huizar talked about her son Manuel Diaz who was killed by Anaheim police on July 21, 2012. She has been organizing against police brutality since then, joining with the families of countless victims to create a movement for justice. She offered her heartfelt solidarity to the people of Palestine.